Published by Hodder Moa Beckett Publishers Ltd, Auckland, 1996. Anne's distinctive, award-winning images of children have become classic icons celebrating life and birth. 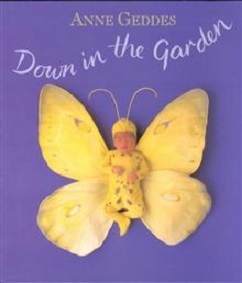 'Down in the Garden' is a journey through a magical garden; one that until now has exited solely in the imagination of highly acclaimed photographer Anne Geddes. Her beautiful and unique collection of photographic images is complemented by gently humorous text and suberb design.